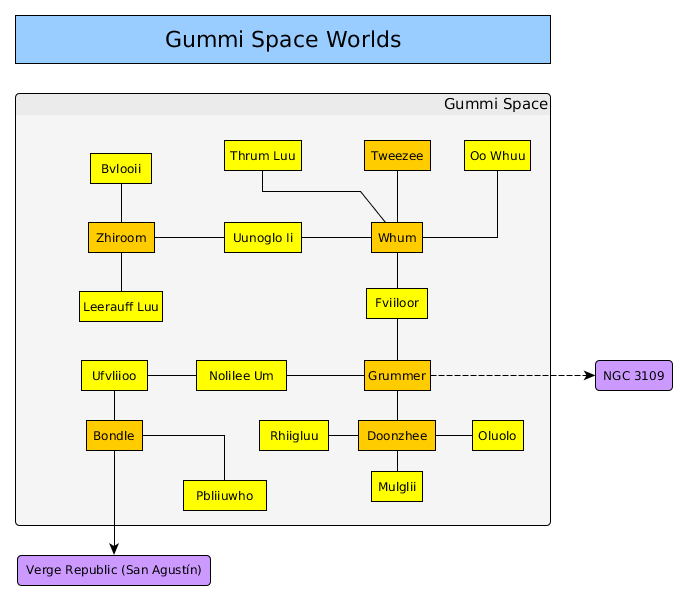 The connection map of worlds within Gummi Space. Major worlds are shown with a mustard color; minor worlds, small colonies, research bases, and mostly uninhabited connector stops as light yellow. Broken wormholes are shown as dashed lines. Worlds lost during the Bump in the Night are too numerous to show here. A high gravity world (25 m/s², 2.5 g) with a thick atmosphere of nitrogen and helium. It has some oxygen, but not much and even those adapted to low oxygen conditions will suffer. It has a complex ecosphere of mostly low-lying, ground-hugging life resembling lichen mats and flattened slugs. A moon around a large gas giant, Fviiloor's star is too white for the Gummi's taste, or that of their entrainments. It has a small research institute studying the local wildlife, and has attracted some interest from Human settlers. Leerauff Luu is a recently discovered world still undergoing survey and exploration. As a tide-locked world around a high-end red dwarf star, it has attracted considerable interest for settlement. Mulglii is an Earth-like world illuminated by a sun that could support both Gummiland and Earth life. Its oceans cover less than half of its area, leaving most of the land as desert. The atmosphere of Nolilee Um is too dense and rich in carbon dioxide even for Gummis. The world is nearly perpetually shrouded in clouds, allowing only wan light to diffuse through from the local sun to illuminate the sweltering landscape below. Life does exist on its surface, and more life lives in the upper cloud banks, floating using bags of lifting gas or drifting as microplankton in the viscous atmosphere. Gummis can tolerate the conditions in the upper cloud levels, athough it is very chilly, and a few floating research stations are located in the atmosphere. A small colony of Pirangs and Tweechis live on this tide-locked world of a red dwarf. It had little in the way of complex indigenous life when first found, but life from the Tweechi and Pirang homeworlds do well here and the first farms and gardens are thriving. A young Gummi colony on the moon of an ice giant. The high concentration of carbon dioxide in the atmosphere is lethal to most other species. An egg-shaped world and part of a close binary planet with Bondle, Pbliiuwho has a thin atmosphere and a low enough oxygen level that altitude sickness is common among those who visit. It has a chilly climate and has extensive ice caps across the polar and temperate regions. Gravity varies considerably over its surface (see the gravity map in the description of Bondle). The same extinct sapient species that arose on Bondle also colonized Pbliiuwho. There is a vigorous biosphere, although still recovering from the mass extinction coinciding with the lost civilization. Rhiigluu is a blasted planet, stripped of its atmosphere and water by the violence of its parent star's death. It now orbits a black hole, and hosts an astrophysical research station to explore this exotic anomaly in space-time. This moon of a gas giant is illuminated by a red dwarf star. Although perfectly habitable, the light doesn't have enough short wavelengths for Gummi crops to thrive, and the day/night cycle confuses Tweechi crops and Pirang forage plants. Thus, there has never been a rush to colonize the world. It sports a vigorous local biosphere with florescent yellow plants. Ufvliioo is a rocky desert world with only small, salty seas. The air is dense with nitrogen with a high concentration of carbon dioxide, just as the Gummis like it, but the oxygen level is low enough to put visitors at risk of altitude sickness. The life forms of Ufvliioo consist of lichen and a few tiny, sluggish animals on land, and primitive seaweed and lethargic worms in the hypersaline oceans. What appeared to be a promising world around a red dwarf star turned out to be an airless planet, its atmosphere stripped away by eons of erosion from the severe solar storms and intense flares from the local sun. Uunoglo Ii now serves as merely a way-point station between two inhabited worlds.